Rosalba Pepi and Maria Rita Faleri with Thessy Schoenholzer Nichols have just released their latest publication on Italian Tassels! It is a book called Nappe, forme di ornamento tessile [Tassels, forms of textile ornament]. The text is in both Italian and English. You can go here to look at a few of the pages and see how the book is laid out (click on the picture of the cover to get started, then click the bottom right-hand corner to flip the pages). 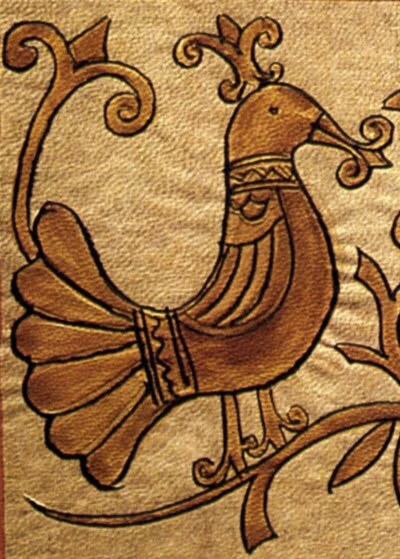 There is a history section with photos of ancient tassels, you can zoom in and read some of it by clicking on the pages. Then there are instructions and diagrams for making 30 different tassels. For those in Italy, you can order the book directly from the website here, payment is by money transfer. For those of us outside of Italy, Elena is carrying it on her website Italian Needlecrafts and she accepts PayPal (there are also a couple of different pages to look at there). The small municipality of Latronico is in the province of Potenza in the Basilicata region of southern Italy. The town has about 5,000 people. Last year at the Italia Invita Forum in Parma, Rosanna Pirotto and Maria Perretti from the Cultural Association Il Tassello caused quite a stir among needleworkers with their Puntino ad Ago di Latronico [needle lace of Latronico] booth. They taught two hour workshops to some 80 people and sold a little booklet on the technique. The technique had already caused a bit of excitement when it was featured on the cover of the February 2009 issue of RAKAM magazine and had a feature article in the April 2009 issue of Ricamo Italiano. The article in RAKAM tells of ancient origins in the cities of Magna Graecia and of the early 20th century popularity of this technique in the surrounds of Latronico as an embellishment for bridal trousseaux. Today in the area it is often an embellishment of clothing, lingerie and table linens. The projects in the Ricamo Italiano issue are realized using very small knitting needles (nos. 1 and 1.5) as mesh sticks and Pearl Cotton no. 12 with a Tapestry needle for the execution of the needle lace netting. 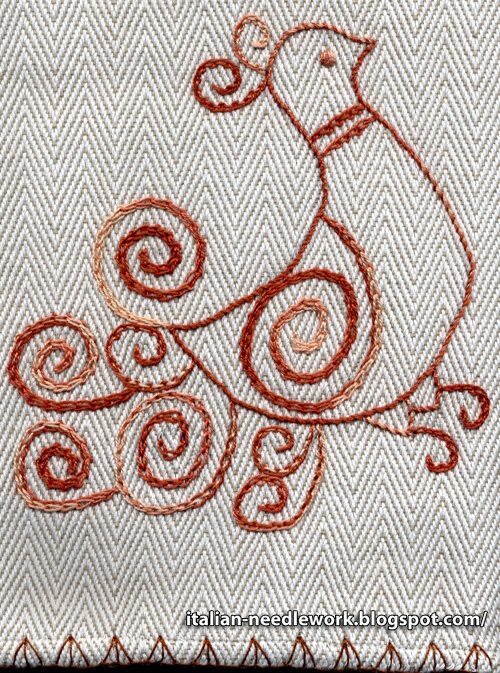 This technique can also be found in Thérèse de Dillmont's Encyclopedia of Needlework online – see figures 618 and 619 and the text under the heading: Loose loops in clusters. If you're up for the challenge, check out Filiforme's latest freebie: gorgeous little bell ornaments made of Latronico Netting complete with stitch diagrams. To mark the occasion they have published their fourth book, Canusino Embroidery over 20 years of Reggio Ricama. I hope it will showcase the pieces in the exhibit but I won't know for sure until I get my hands on it, I'll be sure to let you know! As the title of the book is in two languages, I am assuming that the book is too, though it doesn't say on their website. 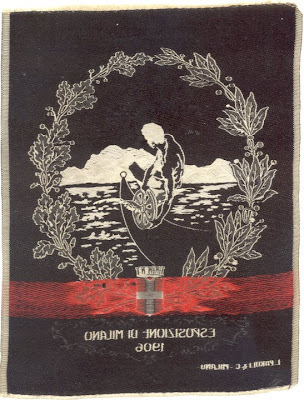 You can see some examples of Reggio Ricama's needlework at a show in 2009 here. Lots of the Reggio Ricama work has been showcased in Italian needlework magazines like Ricamo Italiano and RAKAM over the years. Pieces I would delight to see up close! I told you a bit about Ars Canusina in this post here. It is a very textural and stylized embroidery with designs inspired from architectural details from the castle of the Great Countess Matilda of Canossa and the churches of the surrounding area. If you want some interesting reading (in English) on the Countess, David John Hay's thesis is available for download in pdf format here. At the Reggio Ricama exhibition will also be about 50 pieces from the famous Loretta Caponi collection, though it is not specified if these pieces will be clothing or embroidery, I hope it's a bit of both. If you check out the show, will you write and tell me about it? As you may have been able to figure out, I love knotted stitches! 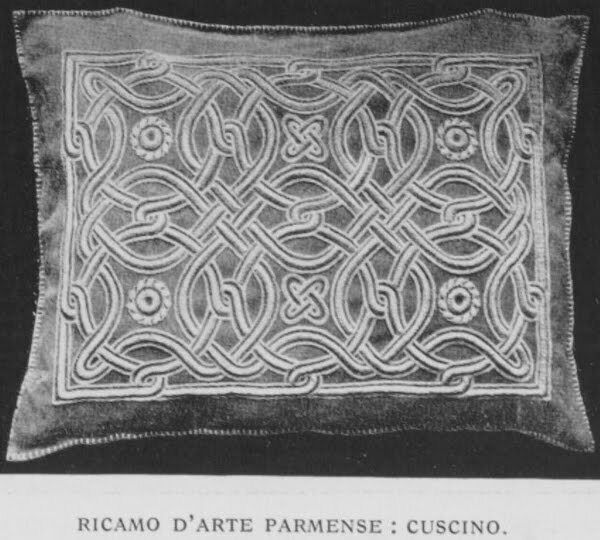 In my previous post I mentioned Punt'e nù or Sardinian Knotted Stitch Embroidery. This technique has long fascinated me and I was fortunate enough to get some one-on-one lessons when I went to Rimini for the Italia Invita Forum in 2007. Many online friends arranged to stay in the same hotel and in the evening we took over the hotel's lounge area and shared our purchases, news and favorite stitching techniques. One lady from Sardinia kindly demonstrated (many times!) the Punt'e nù stitch. She explained that it was best done on evenweave fabric of about 28ct, she recommended Etamine fabric but I was unsuccessful in finding any. DMC in Europe sells it (it is a cotton/rayon blend) though not over here. I'm told the "real" Etamine fabric of old is no longer available though I have seen the name being used here and there for different fabrics, for example Zwiegart markets it as 22ct Mono Canvas. Anyway, I found 28ct Jubilee cotton to be a lovely substitute. Of course at the time (in 2007) I was so exhausted in the evenings after the days at the Forum that I couldn't comprehend much and when I got home my notes didn't make much sense and I was unsuccessful at finding any instructional books on Punt'e nù Embroidery. This year the same Sardinian lady who patiently gave us demonstrations in 2007 decided to put some instructions on her blog. If you look down the right hand side of the page under the heading "Etichette", you will find a series called: lezioni punt'e nù and while it is all in Italian, there are some great photos and even a little video to help you understand the basics of Punt'e nù Embroidery. If you are okay with the Italian, make sure to read all the comments on each post as they are full of questions and answers. Punt'e nù embroidery is done on the vertical warp threads of the ground fabric and is almost always worked on the diagonal. 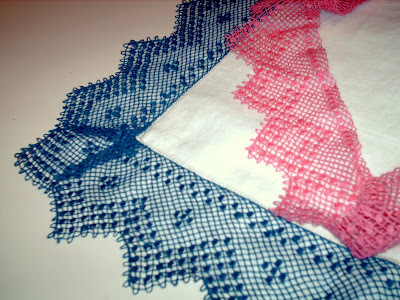 The actual movement of the stitch ascending left to right is pictured in lezioni punt'e nù/6 on Renata's blog. There is a right way to hold your thread, depending on the direction you are going and whether you are ascending or descending. The ability to count is crucial – a skill which I discovered that I lack. I got very good at unpicking my knots during this tutorial!! 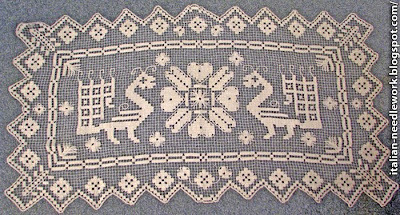 Renata covers all of the basic traditional motifs and there are many patterns throughout her blog. Punt'e nù Embroidery is also one of three traditional Sardinian needlework techniques demonstrated in this series of videos (Punt'e nù starts at 4:45 in the second video and continues into the third video). Set the YouTube video window to display 420p for higher resolution! The first video is good viewing too but covers Punt'a Brodu Embroidery. ... and even Christmas tree ornaments (going outside the realm of the traditional!) based on patterns drawn by Renata. There is very little written on this technique and what there is, is difficult to come by. I've seen a picture of this book: Su Punt'e Nù e su Punt'a Brodu by Quintina Calurgioni though I have been unable to purchase it, and I have downloaded a pdf file (click on the first "Libretto") by the same people who made the above-mentioned videos. Do go through the other links on this page, there are lots of lovely works embroidered by much better stitchers than me! I am deeply grateful to Renata and her endless patience for preparing this tutorial and teaching me yet another wonderful knotted stitch! Check out the little "bird's feet" along the hemline! This piece was also stitched by Elisabetta from Sardinia. She has done a series of embroideries with these birds and I have often told her how much I love them. You can see another one of her bird designs on her blog here. I have seen others, all equally delightful, I hope she will post them all to her blog one day! Usually birds are figured in pairs (as this one was), facing each other across a fountain or tree or even beak to beak. Sometimes they are even very stylized like this rooster here, done in Punt'e nù Embroidery. Can you see him on the corners? 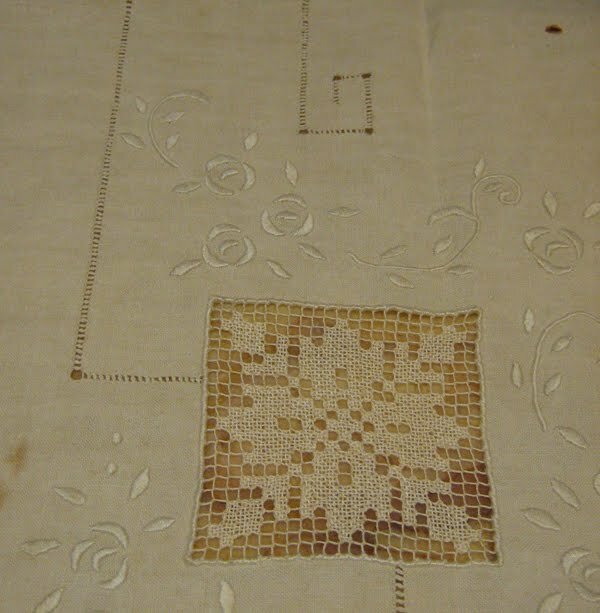 Here is what the motif looks like before stitching. Here are some others. Check out the birds on this lovely Cassapanca [Hope Chest]. At the Sardinian Digital Library website you can download pdf versions of two great books showcasing Sardinian art: Arte Sarda and Artigianato Sardo. 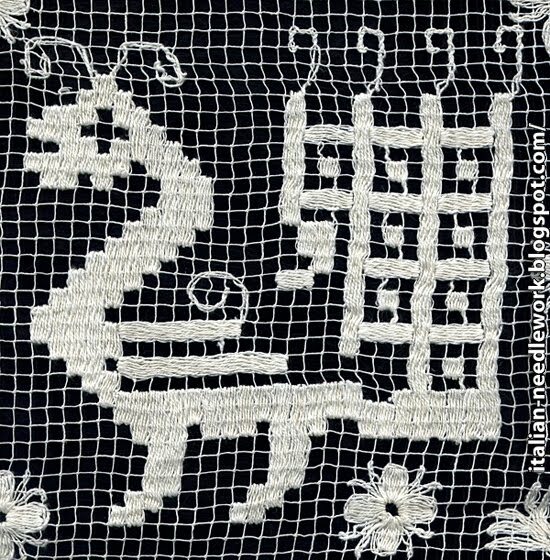 Lots of inspiration there for unique needlework designs! I got an exciting package yesterday which I will be dividing up and showing you over the next few days. I do apologize for the long silences of late, I am having a terrible time with my computer. Time for upgrading and it's never smooth. I think that I have most of the kinks worked out but there are still a few things I need to fix up. It is flawlessly stitched on hand-knotted netting by a lady in Sardinia. Check out her blog for more examples of the amazing work she and other members of her stitching group do. Since I have this piece here in my hands, I can take close up shots, scans, look at the back - you name it!! I can't tell you how happy this makes me! I had the hardest time figuring out which was the back of this work, there are minuscule knots where she has joined her threads and she has hidden her thread ends expertly! I have learned so much just by sitting with this in my hands and tracing the paths of the stitching lines. It makes me itch to get back to a piece I mounted on a frame and started almost five years ago. 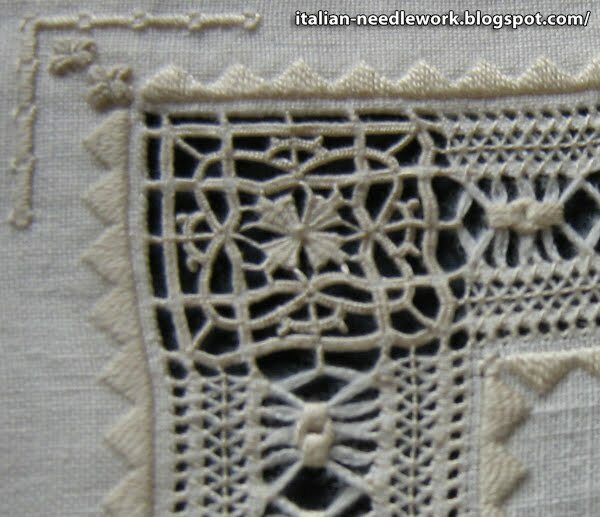 I really like textured needlework and Parma Embroidery is a very textured technique. The principle stitch is a composition of three parallel rows of Chain Stitches with two rows of Buttonhole Stitches worked over the first and second and second and third Chain Stitch rows with the festoons resting against each other down the middle of the band. As with any technique however, practice improves stitch tension and curves can be a bit tricky – you will need to compensate in your Chain Stitch rows. 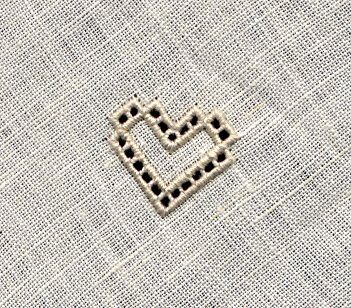 The Patronato dei Lavori Femminili Parmensi (the Society of Parmese Feminine Works) was formed in the early 1920s providing a means of support for the women of Parma through needlework. Under the direction of Bianca Bonfigli Bignotti, the women were set to work embroidering Romanesque designs from local cathedrals, baptisteries, ornate doorways and sculpted friezes. They chose heavy, natural or undyed linen fabric and natural cotton floche thread and went about "sculpting with the needle". The stitches chosen to best imitate the relief effect of the motifs are attributed to the talents of Irma Lanza Balestrieri. 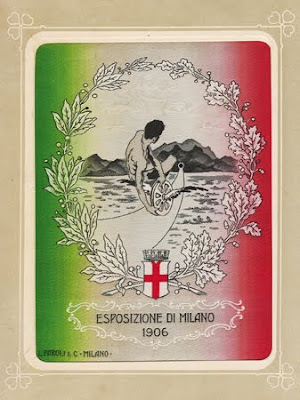 In 1925 the Society produced a book which was revised and reprinted in 1926 called: Motivi Ornamentali dei Nostri Monumenti Studiati per L'Applicazione al Ricamo (Ornamental Motifs of Our Monuments Studied for the Application of Embroidery). 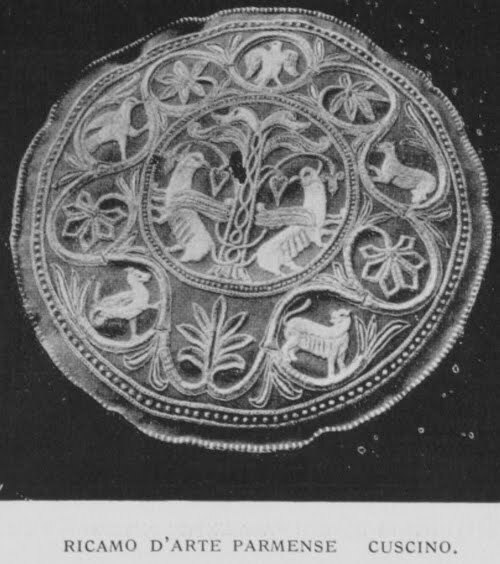 Parma Embroidery earned a Silver Medallion in Florence in 1925 and a Gold Medallion at the Mostra dell'Artiginato e delle Piccole Industrie di Firenze (Artisan and Small Industries Exhibition of Florence) in 1926. 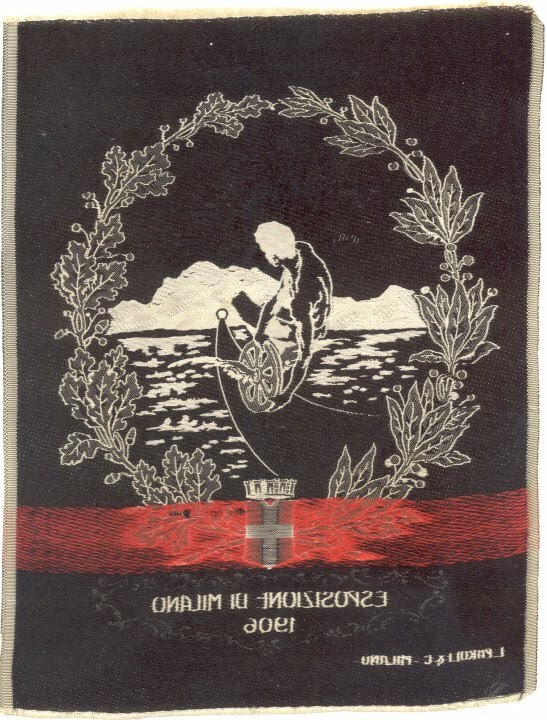 All traces of the Society are lost after the Second World War but Parma Embroidery is mentioned in needlework manuals produced in the second half of the 20th century. You can even see something in English in the Anchor Manual of Needlework reprinted by Interweave Press in 1990. Thanks to the extensive research of Manuela Soldi, in 2009 the second edition of Motivi Ornamentali dei Nostri Monumenti Studiati per L'Applicazione al Ricamo was reprinted with a well-documented introduction, some pictorial images from other Italian publications of the epoch and even some technical instructions done by Liliana Babbi Cappelletti. You can get this publication from Elena at Italian Needlecrafts. Yvette has posted a great picture on her blog of how your curves can look, once you have mastered this stitch! Today a lovely little surprise came in the mail, a little coaster of Sicilian Drawn Thread Work '700. 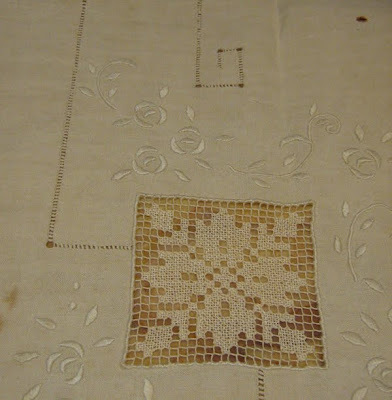 It's done on super-fine linen with what appears to be Pearl Cotton thread. The netted ground is made by withdrawing both warp and weft threads and wrapping the bars. 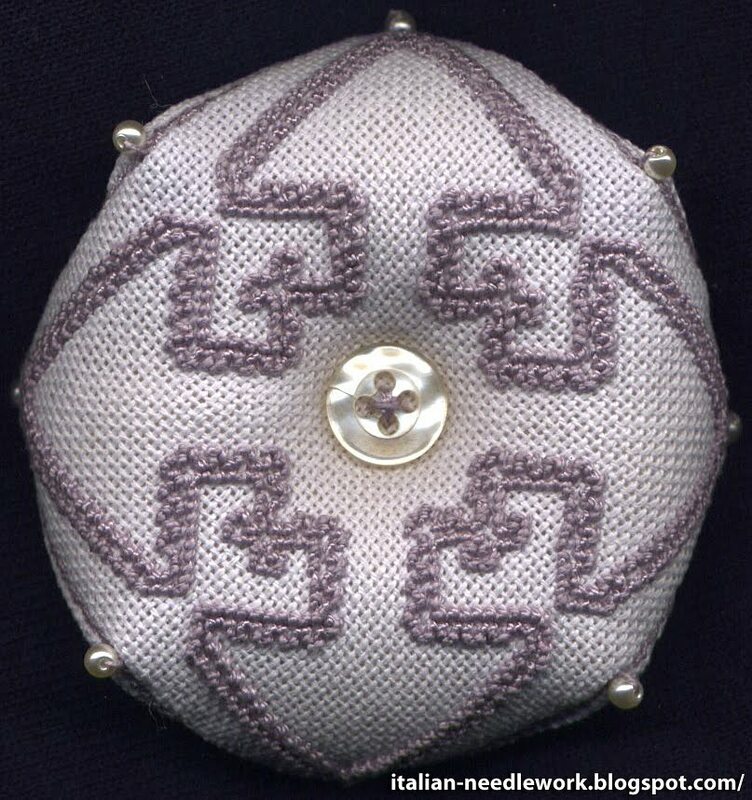 The designs are executed in a Darning Stitch. The piece measures 4.25 inches squared. 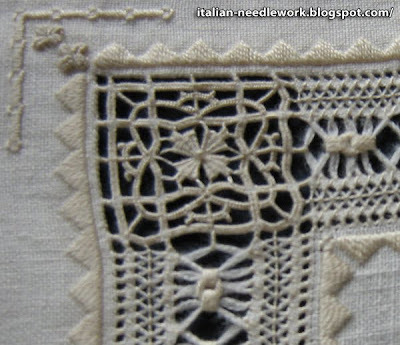 Sicilian Drawn Thread Work dates back to the late 14th century and today falls into three main categories: '400, '500 and '700. 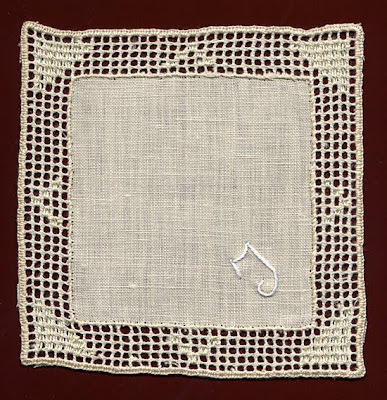 '400: designs are executed in the Linen Stitch on a netted ground described above. 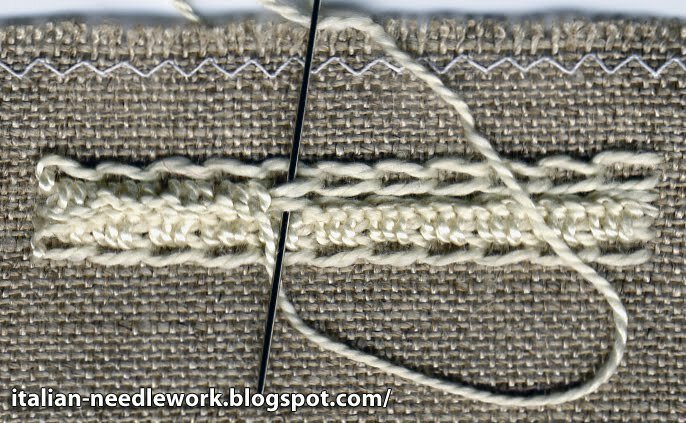 Here is an example of the Linen Stitch that I showed you in a previous post. 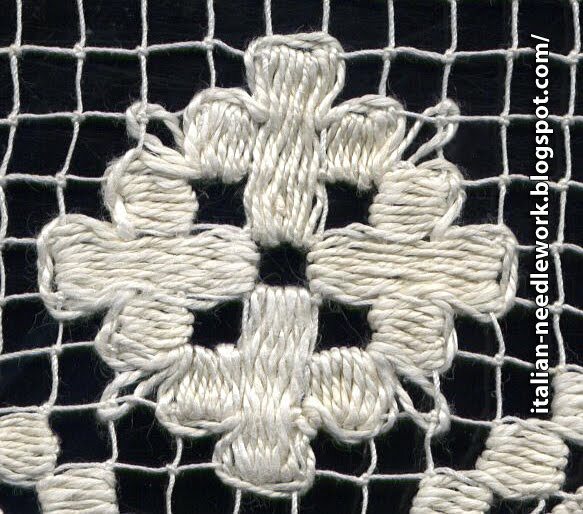 Note: this is Filet work and NOT Sicilian Drawn Thread work - the netting shown here is knotted and inserted. 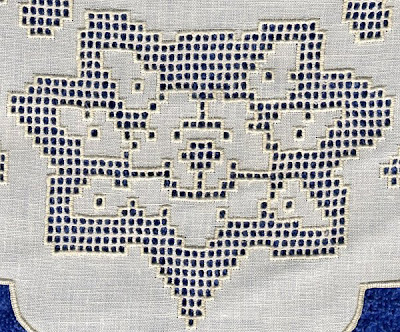 Sicilian Drawn Thread Work '400 is executed on a netting ground made from the ground fabric and uses the Linen Stitch for the motifs. 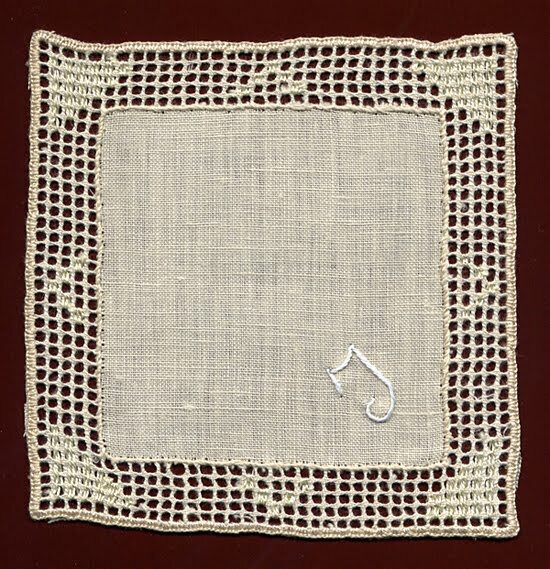 '700: motifs are darned onto a netted ground, described above (my little coaster would be an example of '700). There were also two other categories of Sicilian Drawn Thread Work, the '800 and '500 Vittoria but I'm told that these types have all but disappeared. 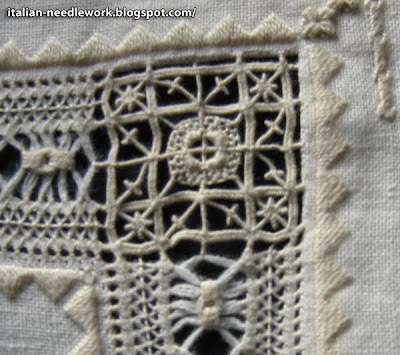 The Anchor Manual of Needlework has a little section on Sicilian Drawn Thread Work but there is not much in the way of books on the subject. If you're lucky enough on Ebay and can afford the crazy prices, you might look for Lo Sfilato Sardo e Siciliano by Amelia Brizzi Ramazzotti published in the early 1920s. 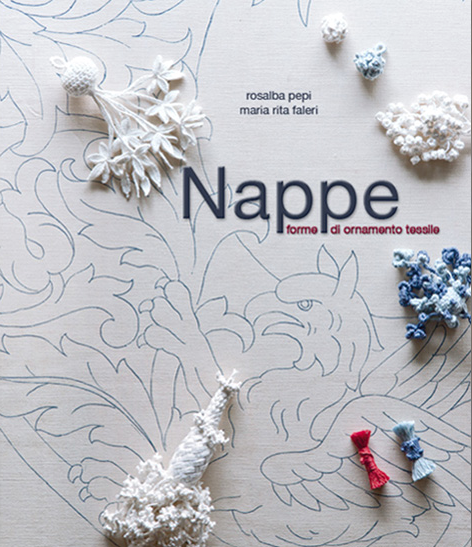 An excellent didactic booklet for making the netting from the ground fabric is: La Rete A Sfilato Eseguita Su Tessuto by Liliana Babbi Cappelletti. I don't see the English version on Elena's website Italian Needlecrafts, but you may want to write to her, or if the English version is out of print, then the Italian Version can be found at Tombolo Disegni (click on Libri/Books, then Libri/Ricamo, then Ricamo Italiani and send an email request to order - it's no. 6 in a listing inside a box with no photos near the bottom of the page). Annalisa has posted a great tutorial on her blog of how to get started by making your basic netting ground. She will continue with a later tutorial of how to do the stitching of the motifs. She has kindly posted my English translations under the Italian. I showed you some of Elisabetta Holzer Spinelli's Drawn-Thread Work back in May of this year. I meant to show you a few of her corner treatments a lot sooner. 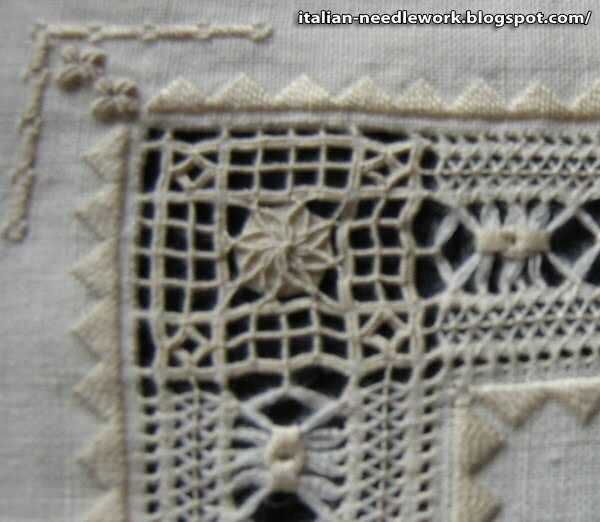 Italian needlework has the most elaborate Drawn-Thread Work that I've ever seen. The possibilities and combinations are endless and mixing in a superb design sense gives breathtaking results. My photos do not by any means do these exquisite corner treatments justice. I apologize for the blurry images, but these were the best that I took. There are several more but you only get a sense of what they are, so I won't post them. Poor Elisabetta! This means that I will have to visit her again with a better camera and beg to spend the afternoon oohing and ahhing over her linen closet. Don't you love the colour combination too? The subtle use of a different colour accents the work beautifully! Elisabetta has so much patience and skill and is a joy to watch when she's stitching or explaining something. I'm afraid that if I ever got a chance to enroll in one of her classes, I'd just sit and drool! 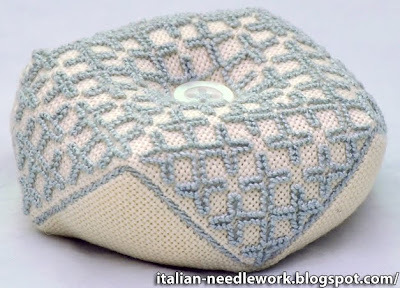 Today we stretch the relevancy of this post to Italian Needlework. Really I can say there is no needlework involved but we can squeeze under the umbrella of Italian textiles. It's my blog so I guess I can justify anything! 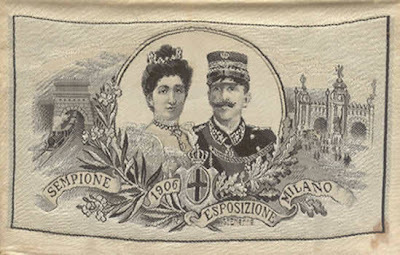 The souvenir above features the portraits of the King and Queen of Italy. Click on the photos of a closer look. 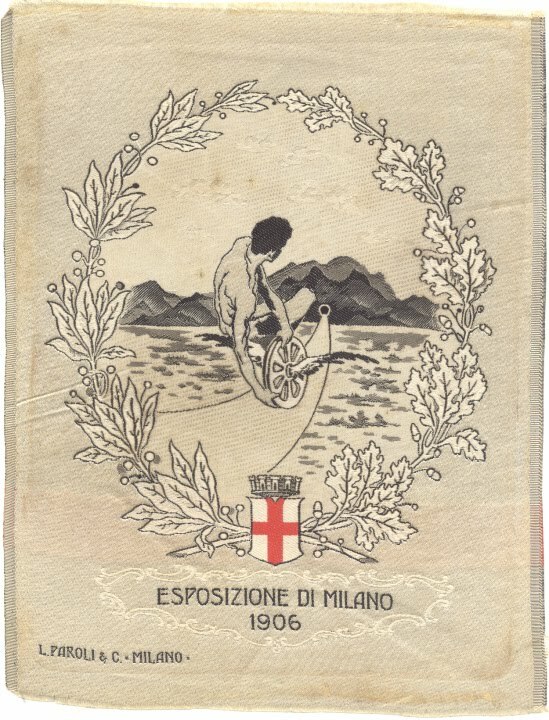 I have been very kindly given photos and the permission to post them of souvenir cards from the 1906 Milan World's Fair which are woven silk pictures. 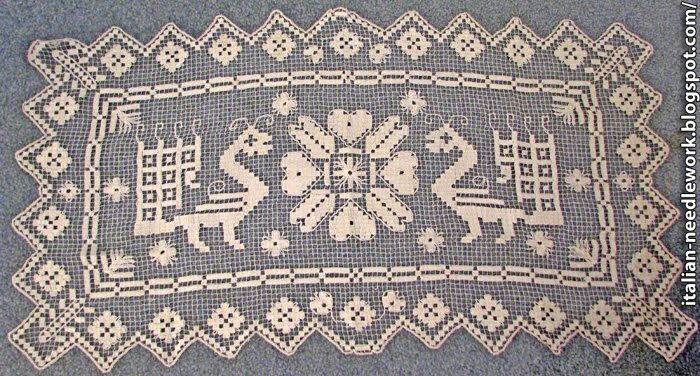 These souvenirs were woven on Jacquard looms, at the time a relatively recent invention which permitted intricately woven patterns. We took a look at some hand-operated Jacquard looms in Perugia in this post, however the looms which wove these souvenirs were almost certainly mechanized. I imagine that as the 1906 Milan World's Fair saw some 7,500,000 visitors the required number of souvenirs would have taxed even the most proficient hand-weavers! These silk woven souvenirs are all made by L. Paroli & C. di Milano. I have been unsuccessful in finding out anything on this company. I am told that even though there may have been a huge quantity of these souvenirs made, they are quite rare to find today, a mere century later. Silk woven souvenirs in good shape are even more difficult to find. 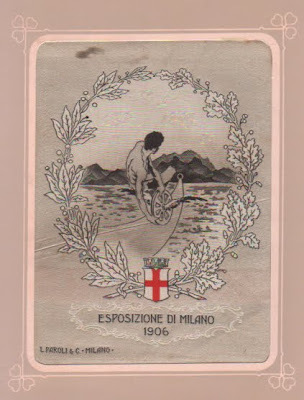 Enormous thanks to Ampelio of the NING group MI1906 for the photos and historical information!